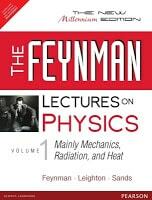 The Feynman lectures on physics are often regarded as one of the most popular physics textbook ever written. Most of the physicist would likely agree that anyone with an interest in physics should read these books at least once. This book is based upon of course of lecturers in introductory physics given by professor R. P. Feynman at the California Institute of Technology during the academic year 1961 to 1962. People call him a "Great Explainer". He discussed each topics in a way that would enhance the interest of the reader.